Last weekend Gordon Lightfoot played the last concert at Toronto's Massey Hall before two years of renovations. In its 124 year history, the greatest names in music including Igor Stravinski, George Gershwin, Bob Dylan, Neil Young, Glenn Gould, Charlie Parker, Joni Mitchell, and St. Michael's Choir School amongst many others have performed in the space. It holds the distinction of being Canada's oldest concert hall, but its design has held up as an intimate space to hear world-class musicians. Cardinal McGuigan addresses the crowd at a concert honouring Ukrainian Greek Catholic Metropolitan Archbishop Andrew Sheptytsky, OSBM. 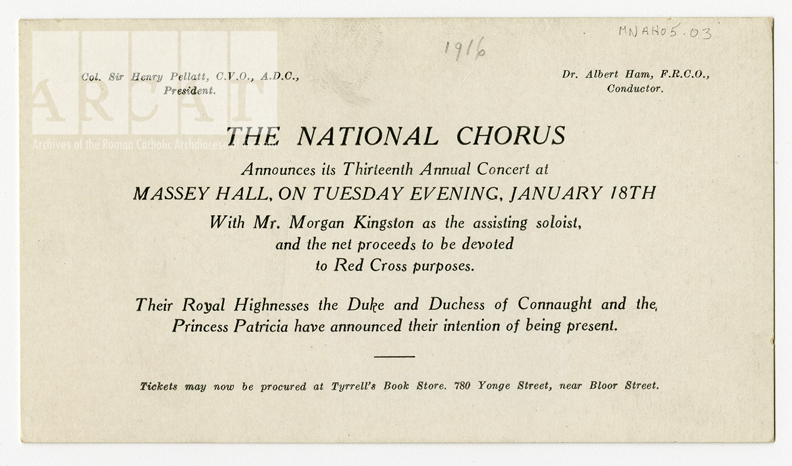 I beg to enclose herewith a platform ticket for the Public Testimonial to be held at Massey Hall on Tuesday, January seventh, at 8 P.M. in honor of the Canadian Soldiers blinded in the war and Sir Arthur Pearson, Bart. The Hon. W.J. 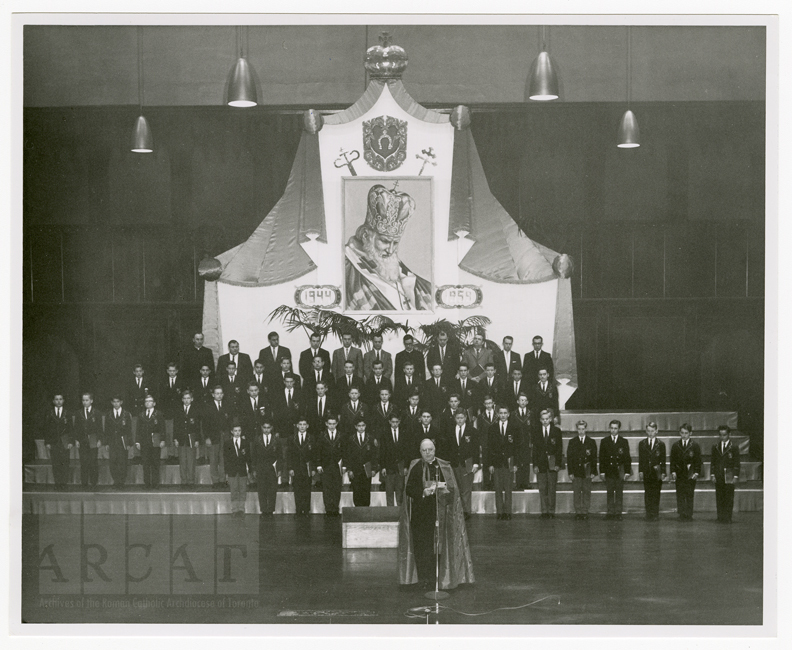 Hanna, K.C., will preside and, besides Sir Arthur Pearson, there will be a number of interesting speakers. On behalf of the institute, I am pleased to extend to you an invitation to be present and to occupy a seat upon the platform. 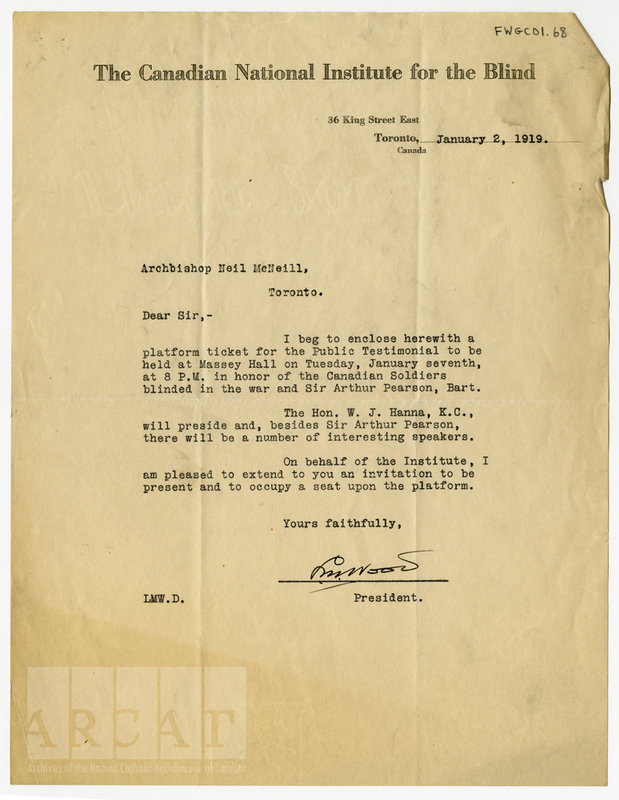 In 1916 Toronto pastors were asked to announce a meeting at Massey Hall of the Associated Kin of the Canadian Expeditionary Forces, which was an association of relatives of First World War soldiers working to "promote and care for the best interests of the men who [were] fighting for King and Country." 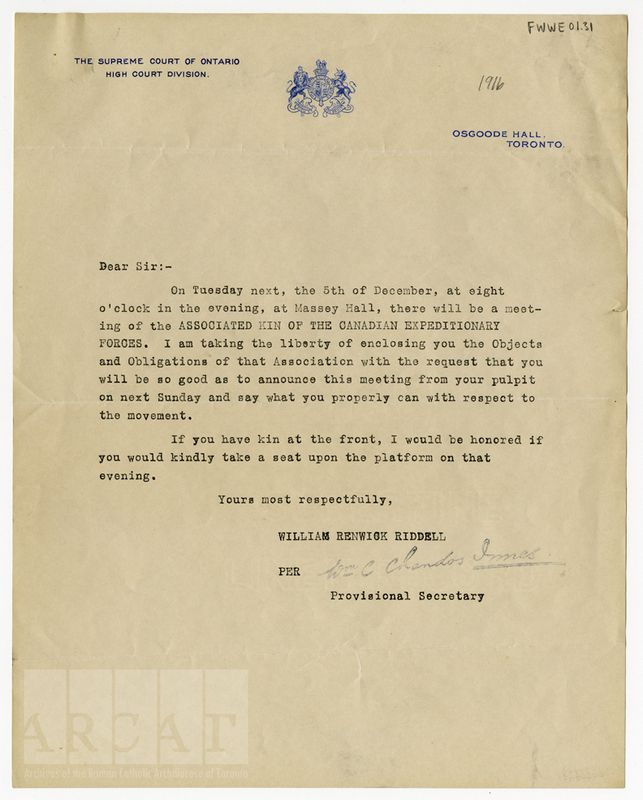 On Tuesday next, the 5th of December, at eight o'clock in the evening, at Massey Hall, there will be a meeting of the ASSOCIATED KIN OF THE CANADIAN EXPEDITIONARY FORCES. I am taking the liberty of enclosing you the Objects and Obligations of that Association with the request that you will be so good as to announce this meeting from your pulpit on next Sunday and say what you properly can with respect to the movement. If you have kin at the front, I would be honored if you would kindly take a seat upon the platform on that evening. 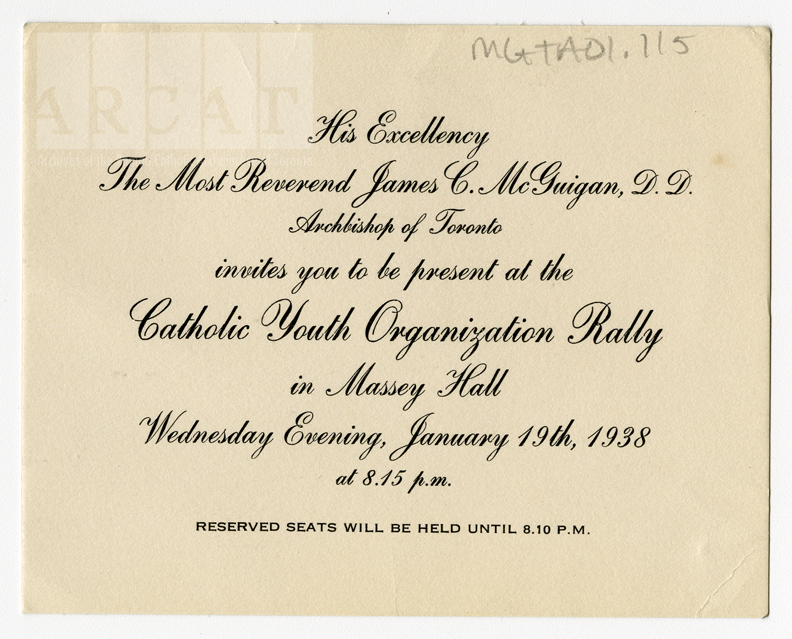 The Most Reverend James C. McGuigan, D.D. Reserved seats will be held until 8.10 p.m."
and the net proceeds to be devoted to Red Cross purposes. Princess Patricia have announced their intention of being present. Tickets may now be procured at Tyrrell's Book Store, 780 Yonge Street, near Bloor Street." On Monday, next, November 28th, at 2 P.M., Admiral Earl Beatty, O.M., etc., will be the guest of the Navy League of Canada at Massey Hall. As Head of the Roman Catholic Church, we are enclosing a ticket, which will admit you, by way of the stage door, to the platform. Will you kindly be seated by 1.45, as the Admiral will enter at 2 o'clock. 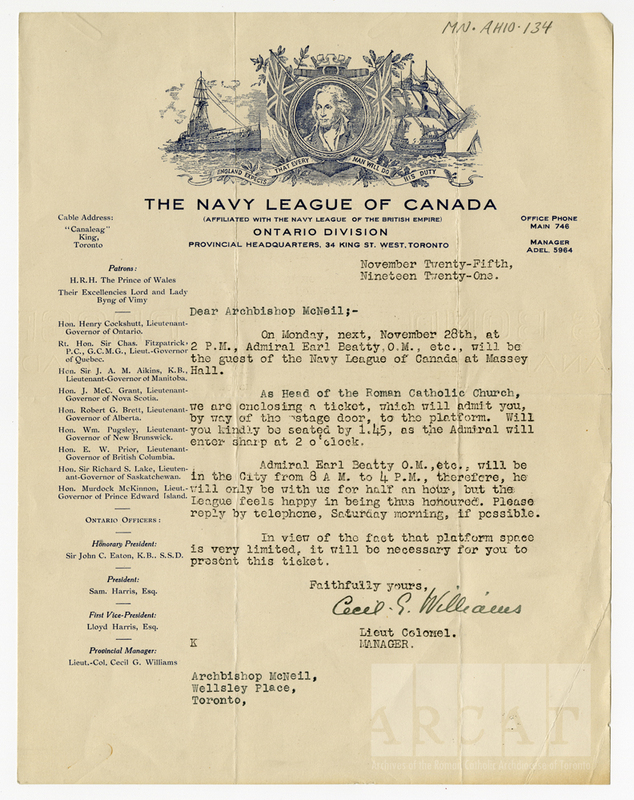 Admiral Earl Beatty O.M., etc., will be in the City from 8 A.M. to 4 P.M., therefore, he will only be with us for half an hour, but the League feels happy in being thus honoured. Please reply by telephone, Saturday morning, if possible. In view of the fact that platform space is very limited, it will be necessary for you to present this ticket. Faithfully yours, Cecil S.Williams Lieut Colonel. Manager." 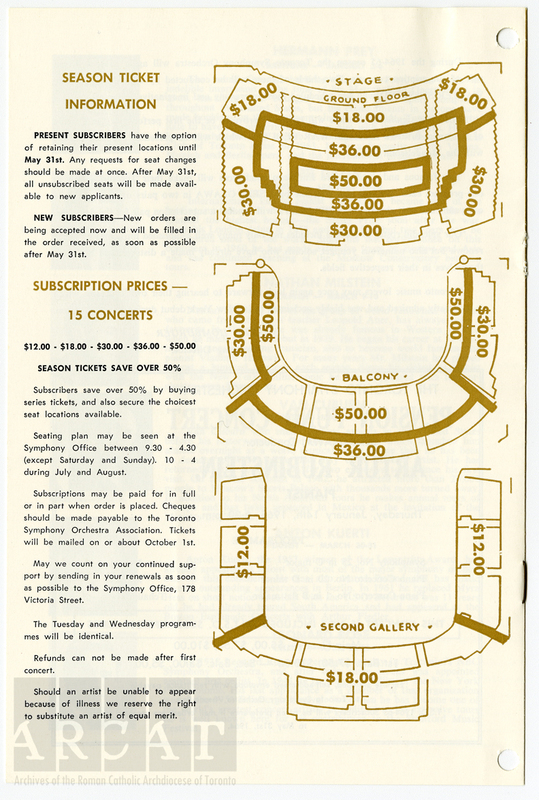 1964-1965 Toronto Symphony Orchestra Season Ticket price chart. Massey Hall holds a special place in my heart because it was the venue of the first rock concert my sister took me to when I was in grade 10. I've seen many of my favourite artists there since then, and I'm looking forward to seeing more after the renovations are finished. It will be exciting to see the changes! In the meantime, I'll watch the Live at Massey Hall series online.